We are happy to announce the release of our second quarterly magazine! 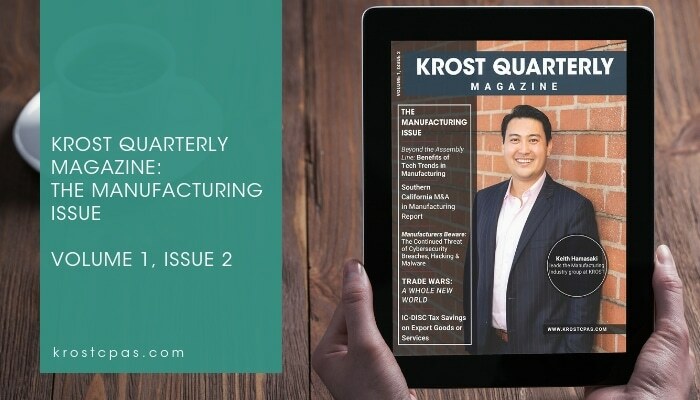 The Manufacturing Issue highlights some of the hot topics in manufacturing including cybersecurity, tax benefits and incentives, technological advances in manufacturing, and trends. Keith Hamasaki, CPA oversees the day-to-day operations of the firm’s audit practice and leads the firm’s Manufacturing and Distribution team. As a trusted advisor with over a decade of experience, Keith's focus is on providing audit and business advisory services to emerging and middle market companies in areas such as process improvement, internal controls, technical GAAP accounting implementation, and procedural review assessments. 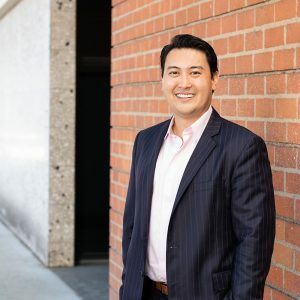 As a thought leader on business and accounting issues, Keith is a public speaker presenting at organizations and educational institutions such as CalCPA, California State University Northridge, Loyola Marymount University, Glendale Community College, and Pasadena City College. Gregory A. Kniss, CPA is the Managing Principal of KROST. Greg has been actively involved with the firm’s business consulting and tax practice for over 35 years. Early in his career, Greg expanded and later became Principal in charge of the firms’ restaurant industry practice which has been one of the largest industry niches within the firm. Luis Guerrero, CPA, MBT is a Principal of KROST, and a Principal and Co-Founder of KBKG, Tax Credit, Incentives & Cost Recovery Specialists. As the Tax Practice Leader, he is responsible for leading a team of engineers and accountants with addressing tax-related matters. Evelyn Fernandez, CPA, MST is a Senior Tax Manager at KROST. She has been in the public accounting profession for over 11 years. Her areas of expertise include tax planning and compliance for high net worth individuals, international entities and individuals, multi-state taxation, partnerships, S corporations, trusts, nonprofit organizations and entertainment businesses.